By the time we were introduced to him in James Gunn’s Guardians of the Galaxy, Ronan The Accuser was already a radicalized zealot. Operating as a servant of Thanos, he very clearly demonstrated a belief in Kree supremacy, and was willing to go to great lengths to prove it to the rest of the universe. Obviously we saw his story come to an end when he was vaporized by the titular team, but soon we will get to see a fresh version of the character, re-introduced in Anna Boden and Ryan Fleck’s upcoming Captain Marvel. Captain Marvel will be diving into Kree society in a way not previously seen on the big screen, including our first look at the alien species’ home planet, Hala. 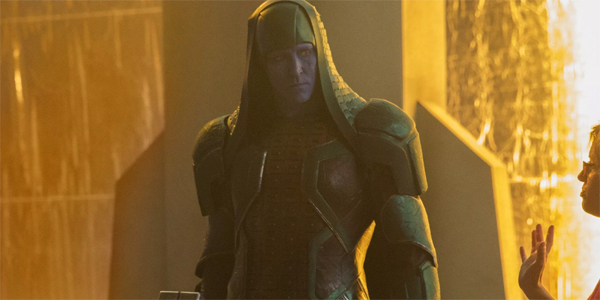 This will be a time before Ronan (once again played by Lee Pace) was cast out for his extremist views, but that doesn’t mean we won’t see them simmering under the surface as he engages in Kree politics. It’s hard to imagine that the new film will entirely transform Ronan into the maniac we first met in 2014, but there is a good chance that we will see him set down that path. What will certainly help jump start things is the fact that we will find Ronan in the midst of centuries-long war in Captain Marvel – which will certainly feed into all of his aggression. While it was the Xandarians who he was trying to decimate in Guardians of the Galaxy, this time around his enemy will be the shapeshifting aliens known as the Skrulls. This means that he will be fighting on the same side as Carol Danvers (Brie Larson) for at least the start of the story, which explains the “intersection with Starforce” mentioned above (Starforce being the elite military unit of which Carol is a part). Of course, we can’t say for certain if their views will line up perfectly as the movie plays out.